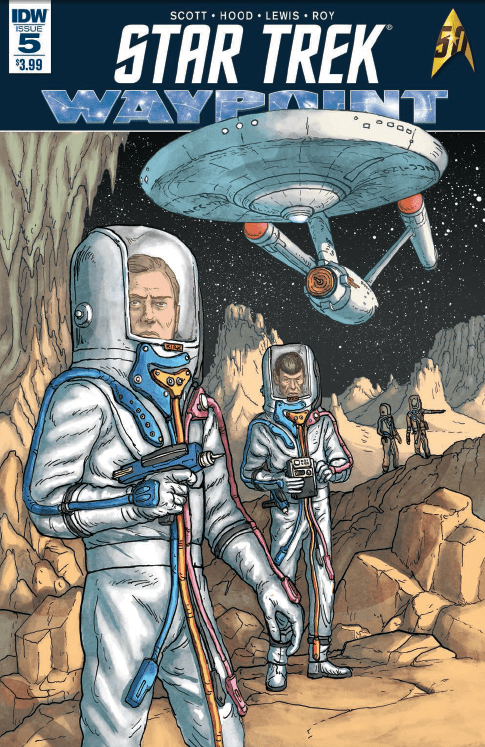 Star Trek: Waypoint #5 Review – AiPT! Two short stories per issue based on the Star Trek universe–from different periods of courses–is possibly the best way to explore the varied characters and timelines. It not only allows creative teams to pop in and out, but allows readers to get two complete stories for the price of one comic book! This issue contains a story based in both the Deep Space Nine and the original Star Trek timelines. Both stories focus on alien cultures unknown to the crew and both house intriguing differences that help the very human Federation characters question what they know. It’s a cool spotlight on the alien side of the series. Deep Space Nine fans rejoice! The first story entitled “Frontier Medicine” is written by Cavan Scott and drawn by Josh Hood (with colors by Jason Lewis). This story focuses in on Julian Subatoi Bashir with Odo and Miles O’Brien who encounter some strange aliens made of energy. This story does a great job showing how, even if you think you know it all, you probably don’t. Bashir attempts to do the right thing as it appears a patient is in danger, when in fact his approach is all wrong. The captions by Scott do well to capture the wonder and confusion of Bashir, plus he utilizes Odo and O’Brien in the perfect ways. There’s a consistent use of the characters that makes it feel like it was plucked from a long lost episode. The second story is entitled “Come Away Child” and is written and drawn by Simon Roy. This story opens with ensign Laura Herrada saying farewell to Spock and the crew of the Enterprise to study alien creatures with a somewhat crockpot scientist. They must not interfere with the alien culture–a race of humanoid people evolved from whales–as the Prime Directive is of the utmost importance to uphold. The problem is Laura and the scientist aren’t too close but must live together for months. The relationship is frayed and Roy does a great job delving into that loneliness, and the things humans may do to find a connection, very well. I can’t stress enough how good this story is, because its meaning and purpose don’t actually reveal themselves till the very last page. Roy’s art also gives it a real world vibe that’s a bit ugly and imperfect. That is some freaky s--t! One could argue the second story, however great it is, doesn’t fit in the Star Trek mold like most of the stories in this series. There’s no TV show character leading the charge or much of a vibe from the show. That said, its purpose in showing exploration is perfect and fits the themes of the show nicely. This is an excellent example of how good this franchise can be as it’s not only thought provoking, but captures the essence of discovery the show was so good at. Both stories are worthy of a read and capture the magic of exploration in a universe where we may think we have all the answers. A great installment of the series that captures the discovery of Star Trek very well.